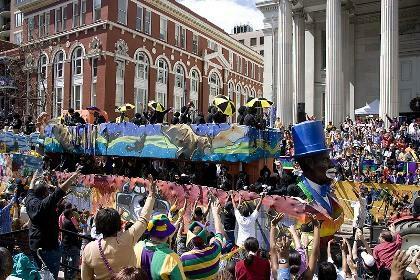 Mardi Gras has been well known around the world for hundreds of years now. As one of the biggest parties of the year, Mardi Gras offers people the chance at one last indulgence before beginning their fasting during Lent. According to history, the popular holiday began in New Orleans, LA when a French king sent his men to defend the French territories in the United States. When the men arrived in the U.S., they settled in an area known as Point Du Margi Gras. As the population in this area grew, the Creole population developed the Mardi Gras (which means Fat Tuesday in French) tradition to feast one last time before beginning their fasting for Lent. As the holiday grew bigger each year, more parties and parades were incorporated into the festivities. The Rex parade is credited for starting the tradition of handing out beads during Mardi Gras as the parade company passed out glass beaded necklaces to onlookers. The beads use three main colors which are purple, green and gold to represent justice, faith and power respectively. Today, the Mardi Gras celebration has grown into a week-long event celebrated in New Orleans with lots of partying, dancing, and eating. Some of the popular Mardi Gras foods include gumbo, King Cake, and paczkis.